I love getting a day at home at this time of year. Yesterday we had the whole day at home and it was lovely. It wasn't just a regular quiet kind of day at home - there were "Big Doings" going on. We all had something we were working on and some of those things were secret too. Closed doors now mean knock and wait for permission before entering. I have been finding little notes here and there throughout the house - Santa's coming, Only 28 days left, and other such things. One note was taped onto my sewing machine yesterday. I spied it when I went to work on another artist tote. I love that my boys find this time of year magical. I love that they want to hide away and create gifts all on their own to give to loved ones. I love the ideas that they come up with (some of which are secret from me as well). That looks so yummy! Go E, go!!! 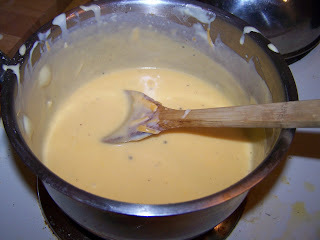 Is it a roux with cheese + his special ingredients added to macaroni? 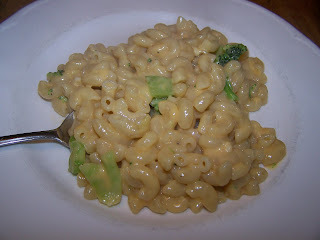 He's got me craving some mac and cheese now :-) I can't wait for his cookbook to come out! E is an artist in the kitchen it seems. Looks delicious! 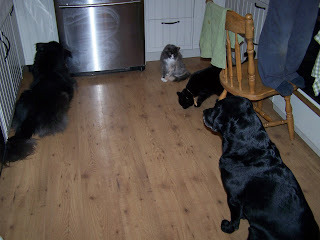 I'm guessing it smelled so good that all the pets began to congregate near the chef in hopes of some taste testing? Oh, I am getting so excited myself. I love this time of year. It really IS so magical. I bought The Children's Year at the Waldorf fair and now I'm busy making a little Advent Spiral for the table in the front hall. Even though Max is older he still gets giddy at the idea of a strange man in a red suit coming down the chimney in the middle of the night.